2.1 1. Do they dry quickly? 2.2 2. Do they stretch? 2.3 3. Are they durable? 2.4 4. Are they breathable? 2.5 5. Are they comfortable? 2.6 What other features do they have? A great pair of hiking pants can go a long way toward making your next hike better. Whether you plan on being outdoors for a few hours or multiple days, a high performance pant can make all the difference. As someone who used to backpack in jeans, I can vouch for the importance of lightweight hiking pants that dry quickly, breathe well, and repel water. There are an overwhelming amount of options, so I wrote this post to help you decide on the best hiking pants for you. To help you make an informed decision, I have listed the top five things to consider when you shop for hiking pants. Below that, you can find my top five picks for the best hiking pants. 1. Do they dry quickly? Chances are you have encountered wet weather on a hike or slipped on a rock while crossing a stream. There are few worse feelings I can think of than wearing around a pair of wet pants. Make sure to find hiking pants that dry quickly. You don’t want your hiking strides to be constricted by a stiff pant. Opt for hiking pants made with fabrics that are stretchable. You will appreciate the added mobility on the trail. Your new hiking pants should be rugged and long lasting. Great pants are not cheap to buy, so it is reasonable to expect them to hold up. As you shop around, look at reviews and see what people are experiencing. As you hike, heat and sweat are generated by your body. When you stop to rest, your body cools off. If it is covered in sweat, you will get cold. To avoid this, make sure you find hiking pants that are breathable and wick away moisture. As you compare hiking pants, this is perhaps the most important consideration to make. How do they fit? Are they too tight in any particular areas? Make sure you are happy with how they feel before you commit. 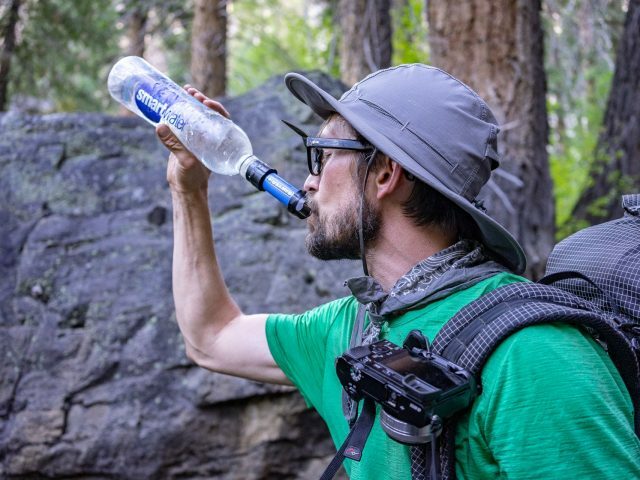 This is even more important when hiking or backpacking long distances. What other features do they have? Can they convert to shorts? Zip-offs aren’t for everyone, but I find them useful. All pants provide sun protection, but some do more than others. Look for the UPF rating. The higher the number, the more UV it blocks. I like pockets with zippers. Without them, I wind up losing stuff. If you are like me, the quest to lower your backpacking weight never ends. Just because you are hiking doesn’t mean you have to look bad. Out of my five picks for the best hiking pants, the prAna Stretch Zion is a clear winner. These pants are a home run in every category. They dry quickly, are durable, breathable, comfortable, and are rated UPF 50+. This means they block out 98% of the sun’s UV rays. Also, their DWR coat repels impressive amounts of water. I tend to lose weight on multi day trips and the adjustable waistband is another nice feature. As an added bonus, these pants are available in nine colors. The Outdoor Research Ferrosi are another excellent choice for a hiking pant. They are comfortable, stretchable, and wind-resistant. These pants are tough and hold up well over sustained use. They are quite minimalist, so the pockets are small, but the thigh and back pockets have zippers. Of the hiking pants I recommend, these are the lightest ones. The North Face Paramount 3.0 pants are designed for hikers looking for a durable pant with all of the fixings. These pants have a relaxed fit that provides good comfortability and offer a DWR finish and UPF protection. These are the heaviest pants I recommend. Some people prefer them over the prAna Stretch Zion pants for their stylish look and slimmer fit around the legs. The Sherpa Khumbu Pant was created with long treks in mind and is made of a unique fabric that consists of 88% nylon and 12% spandex. These pants are super comfortable to wear and provide ample stretchability plus water resistance. Their UPF is not listed, so I assume it is less than others. That being said, they look and feel great on. You won’t ever want to take them off. The Columbia Silver Ridge Convertible pants are my budget pick. I like that they are priced low without any glaring compromises on quality. These pants wick away moisture, feature UPF 30 sun protection, ripstop fabric, and a zip-closed security pocket. They are not as stretchable as other hiking pants I have recommended and do not repel water. Still, these are a good choice and can save you some money.